Book for autumn now – New NLP Practitioner opportunity! Gannets are on my mind this week. Sometimes a bird just gets a bad press. Until a few days ago I thought I knew all I needed to know about the gannet; i.e. 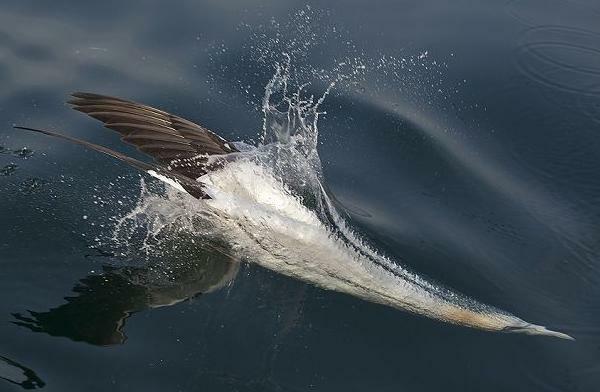 gannet – ˈɡanɪt/ – greedy bird (what my own mother called me when I purloined chocolate cake) which breeds in overcrowded quarrelsome colonies of hundreds of thousands on remote island rocks off Scotland. That was before I saw a film recently of gannets diving for fish. Suddenly I was witnessing something astonishing. A handsome bird with an almost 2 metre wingspan hovered a 100 feet in the air like a kite or an eagle and then performed a spectacular nosedive at 60 miles per hour into the sea, becoming streamlined like a torpedo just before entering the water. Somehow it then turned again from torpedo into bird to beat its way out of the water into the air again with a fish in its beak – Watch it here. What grace and power! Completely awe inspiring to watch. That wasn’t the end of my gannet week though. The next gannet event was ridiculous. I saw a clip of young gannet fledglings on the high rock where the birds breed. At some point the fluffy young bird had to summon up the courage to jump off the cliff. It was too heavy to fly, so it half fell, half fluttered, banged itself on rocks, miraculously got up again, fell again, hit rocks again and bounced, got up again, fell again, and eventually dropped into the sea hundreds of feet below. How it survived I have no idea. What a scene of tragic-comedy! It struck me reading the week-end papers at leisure last week-end how much we are presented with just one view at a time. A while ago we had pictures of a strong leader with statesman-like pose meeting other world leaders at an international event. This week-end the news is of an evil tyrant and every photo shows the man with an evil expression – same man, different moment, different view. It’s the stuff of soap operas of course, perfect for keeping a story going. We thought she was a ‘goody’; but oh no! she’s a ‘baddy’ after all! People protesting in the streets wear identical face masks of a certain politician bearing the same fixed expression – just one view. There you are, you can see that he’s not to be trusted, he has the ‘not-to-be-trusted’ expression fixed and unchanging on his mask of a face! Great for soap operas and Mills and Boon; not so good for understanding people well. When I’m coaching someone, sometimes they present to me an image of ‘vulnerable and absurd’ and tell me silently to believe it. But I don’t, because I know that hidden in them somewhere is also ‘powerful and extraordinary’; I believe in its existence even if they don’t themselves quite yet – and bit by bit, being seen, it finds the space to emerge. I like the last bit about images of being wonderful hiding a person’s wonderfulness – I know people who do that, don’t you? More blue language; more helpless sighing. ‘Vulnerable and absurd’ feels like the whole of me, I’m quite incapable of seeing beyond it. And then – sometimes! – I look inside and discover ‘powerful’ and a whole new way of feeling and being. This allows me to take heart and proceed resolutely to resolve what is only a technical blip after all. We are people of parts. There’s almost more – beyond what we believe to be there. Wouldn’t it be great for the media in the 21st Century to mature into a greater appreciation of the multi-dimensionality of people – less of the cut-out 2D image, more of an exploration of the amazing amalgam we all are? They might think we’d hate it. I think we’d find it riveting. Me and you – are you listening! Check out this new funding stream if you are interested to apply for my NLP Diploma, Practitioner or the Voice of Influence course next autumn – it could save you considerably. The new Government Leadership and Management Advisory Service is offering funding for leadership and management skills for small businesses. Further details here. The next NLP Diploma starts in October. Please see ‘Testimonials’ on my website for some of the comments of recent recipients of the award. NLP is the great confidence builder – the Diploma offers six days of rich practical learning over a couple of months. People find it difficult to put NLP in a nutshell, but what you will certainly get out of the Diploma is the ability to be a more effective communicator and get on better with everyone, surer direction in your life, greater self awareness – including liking yourself better! – more influence and increased success at work and outside. This makes it a great leadership course – a multi-dimensional package! i. Book each of the 3 modules individually but at the same time (the discount only works if you book all three at once). Booking all three automatically triggers a 30% discount to start with. ii. In the Voucher box, insert VOI SPECIAL. That will give the additional discount, bringing the price of all 3 workshops booked together to £850. Alternatively, just fill in the booking form and email to me! New opportunity! People have been asking me if they can continue on from the Diploma to the full NLP Practitioner and the answer – this year at least – is yes! If you already have my NLP Diploma or plan to take it this autumn, with three extra days of training in January 2012 plus a coaching session and individual study you can become a qualified NLP Practitioner through group coaching by February 2012. It’s an exciting course and probably the best value Practitioner you can do anywhere! If you are interested please let me know immediately at judy@voiceofinfluence.co.uk. I will send you further details for your final decision very shortly. Finally, I’d like to highly recommend two fascinating books in that great ‘Dummies’ series by friends of mine. NLP and Coaching for Dummies by Kate Burton is now out and the current Amazon price is especially good. Persuasion and Influence for Dummies by Elizabeth Kuhnke is available for pre-order – soon to be released. Happy summer days to all!